This is the updated version of a story originally written in 2010. In the age of retail chains – including in the outdoor gear business – AVI Industries engages for being the exact opposite. The business is run by 73 year-old Ravi Kamath and his son, Avinash. The small shop in the Mumbai suburb of Matunga is older than the father. 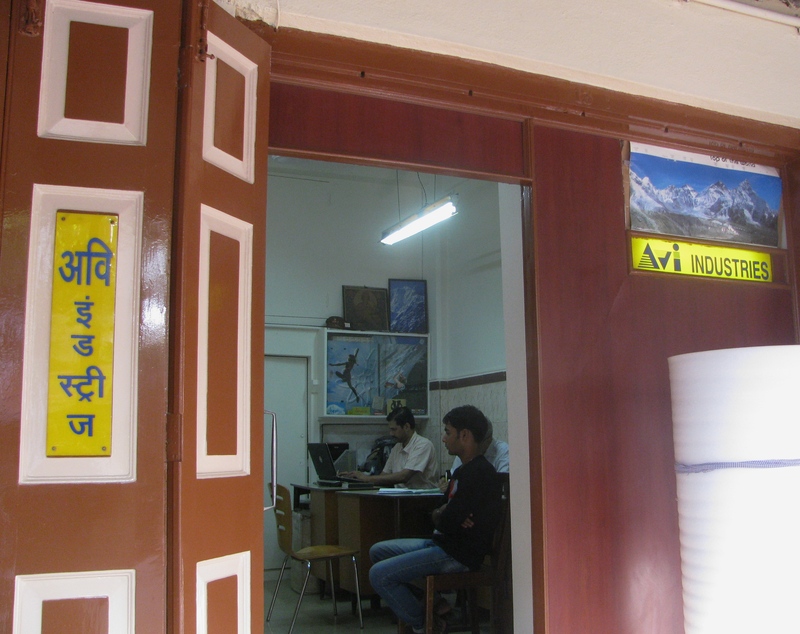 Despite the enterprise being well known in the Indian outdoor industry network AVI Industries operates no other shop. It is a distributor of carefully chosen products with a characteristic outdoors-aversion for the glitz of retail. The locality, near the Matunga railway station, is crowded and congested. The shop is housed in an old building close to the busy road. The old building is the sort of place where stories lurk and Ravi Kamath’s at AVI Industries, is an interesting one. Kamath grew up in Udupi. His best memory of childhood is a sand pit with parallel bars and Roman rings, where every evening a volunteer-instructor trained children. Looking back, he felt that may have contributed to his emergence as a climber when the opportunity first came his way in January 1968. He had by then moved to Mumbai where his father lived. Kamath enrolled for a training camp announced by Climbers’ Club. The teachers at the camp were all Sherpa instructors from the Himalayan Mountaineering Institute (HMI) Darjeeling. Kamath who was assisting his uncle in a dyes business became a frequent rock climber at the city’s old crags – Wagle Estate in Thane, Kalwa, Mumbra and Borivali – some of which have since faded. “ The general public was quite disinterested in us,’’ he said of Mumbai’s early crop of rock climbers. 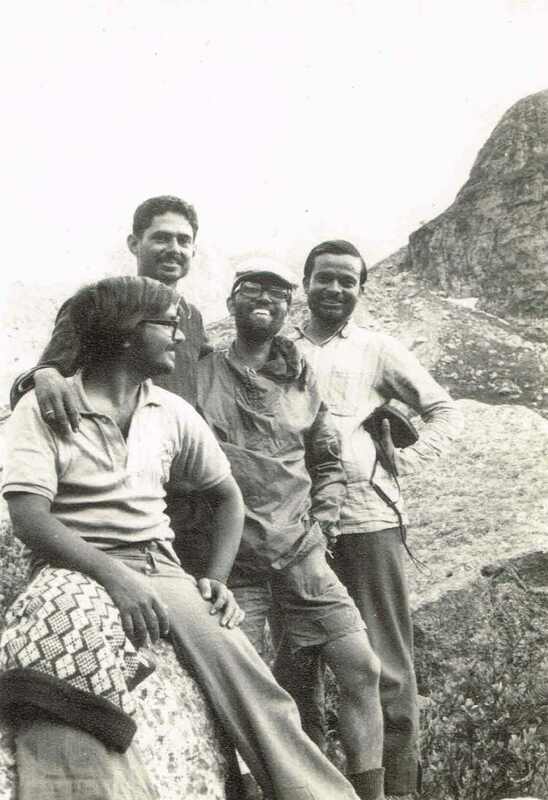 In November-December 1968, he and two other climbers from Mumbai attended HMI’s 35 day-Basic Mountaineering Course. 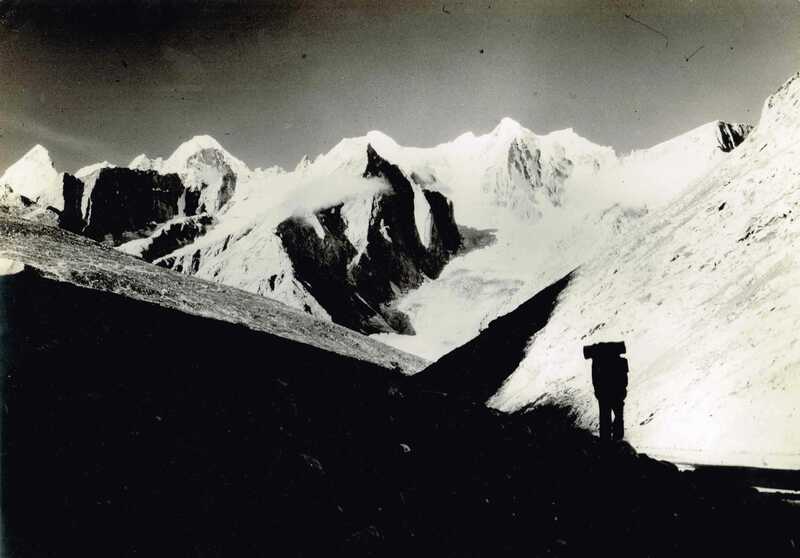 In 1972, he went on his first Himalayan trek, to Muktinath in Nepal. In 1976, he did his Advanced Mountaineering Course from the Nehru Institute of Mountaineering (NIM), Uttarkashi. There he met climbers from the Indian Institute of Technology (IIT), something that opened up possibilities for meaningful collaborations on climbs. One of the immediate outcomes of this was the first ascent of a rock pinnacle in Mumbra, among early climbs of this sort in Maharashtra, where the ascent of pinnacles has remained a traditional favourite. Pinnacle-climbing bloomed after expansion bolts were introduced. Expansion bolts work as permanent anchors; they reached the Western Ghats of Maharashtra in the 1980s reportedly first on a pinnacle called Hadbi-chi-Shendi near Manmad. In the days preceding expansion bolts when the early pinnacle-climbs happened, removable pitons were used for protection. Although HMI instructors gifted them some foreign pitons, pitons in general were too expensive for Mumbai’s pioneers and the stuff made in Delhi was unreliable. This issue of cost was real for although Kamath now ran a business selling liquid soap, he was married. Lifestyle was frugal. With IIT trained-Mukund Bhagwat, who had been part of the Mumbra pinnacle-ascent team, Kamath addressed the piton problem. The climbers first opted for rigid retrievable pitons over the malleable variety that can’t be removed from rock once hit in. Then they realized that spring steel was the best material for such a piton and started making pitons from the leaf springs of cars. Kamath’s business, as said, was making liquid soap. The success with pitons started leading him elsewhere. Encouraged by the locally made pitons, he soon began manufacturing `figure of 8’ descenders and choke-nuts, part of the hardware used in climbing. He also reverse engineered the classic Don Whillans climbing harness. Because climbers trust their life to it, climbing gear must be tested. Testing labs and certification agencies existed overseas. In India, they were either absent or where present, were very expensive. So the climbers, who were making the gear, tested it themselves. What genuinely changed Kamath’s destiny were rucksacks. Initially cloned from an American design and subsequently improved for local use, the sacks made at home by his wife and sister soon became the reason for outdoor enthusiasts dropping by at the Matunga shop. None of it radically altered his financial struggle though. He was busy reconciling the seemingly irreconcilable – business, family and climbing. It pushed self and family into tough times. In 1977, Kamath was part of a team that attempted Makar-bey in Himachal Pradesh. It was the next climb in 1978 that cemented his reputation in Mumbai’s mountaineering circles. He led a successful expedition to Ali Ratan Tibba, a rocky peak in Himachal Pradesh, an objective much sought after by discerning climbers. Even today it is not always successfully ascended. Kamath’s expedition was the first successful Indian ascent of Ali Ratan Tibba. Much preparation had gone into this expedition; the team climbed with loaded packs in Mumbai, they also practised climbing at night. The next memorable trip was to Peak 20,101 in Himachal Pradesh where the summit team had to retreat following a slip in an ice gully, successfully arrested by a homemade-choke nut. “ That nut must still be there,’’ Kamath had said laughing when this article was first written in 2010. Back in Mumbai, the liquid soap business suffered when he was away in the mountains and atop that, he had to pay for a business assistant. Still there was no surrendering his passion for climbing. By now disillusioned with club culture and large expeditions, Kamath began favouring small teams. 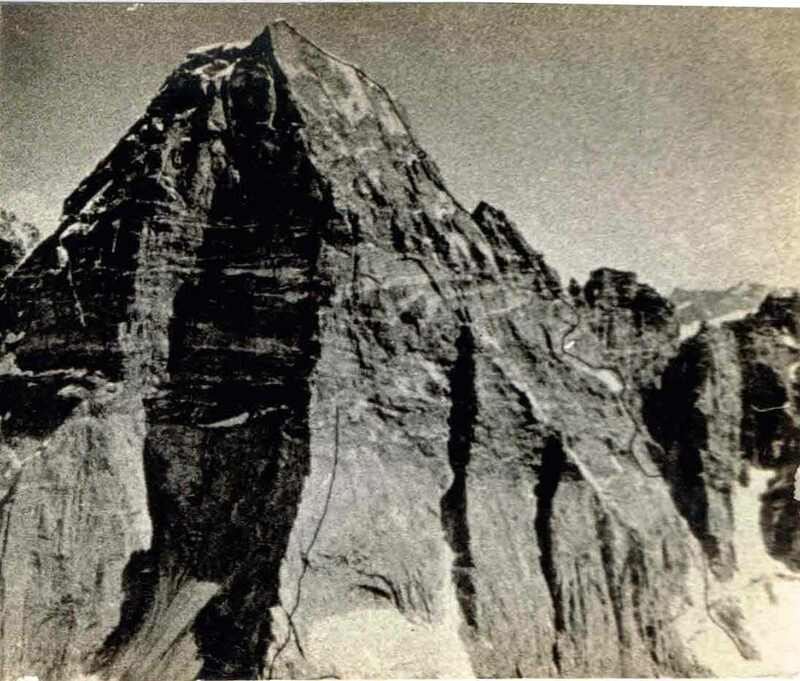 After 1981, there was a successful attempt on Koteshwar, a failed attempt on Jogin-II and a successful climb of Lion Peak. 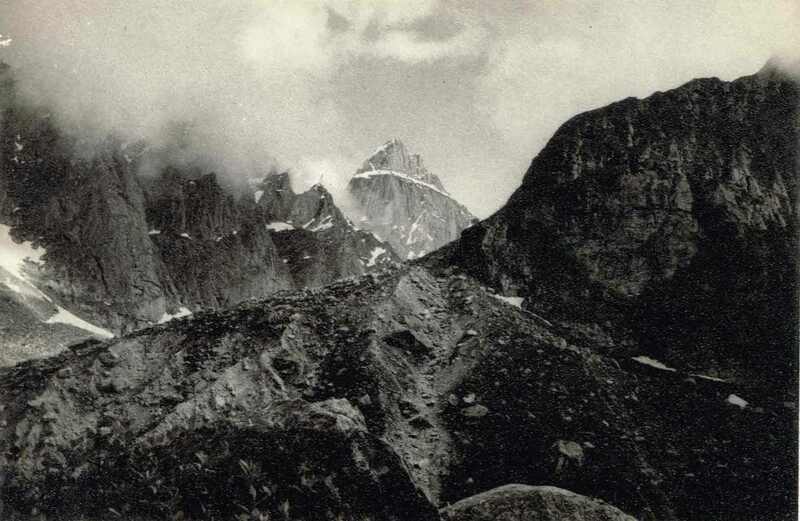 In 1990, there was an attempt on Brahma in the Kishtwar Himalaya with a group from Bengaluru. He also did the Roopkund trek, crossing over to the Shila Samudra Glacier on the other side. Since the early 1990s, every other year he has been climbing rock with friends in Pachmarhi, Mt Abu and Pawagad. Kamath narrates his experiences with no show biz traits. No social media, Instagram or Facebook influence on this man. He has a dispassionate approach to climbing; he talks with deep respect for method and precision, something you see when he sells a product too. 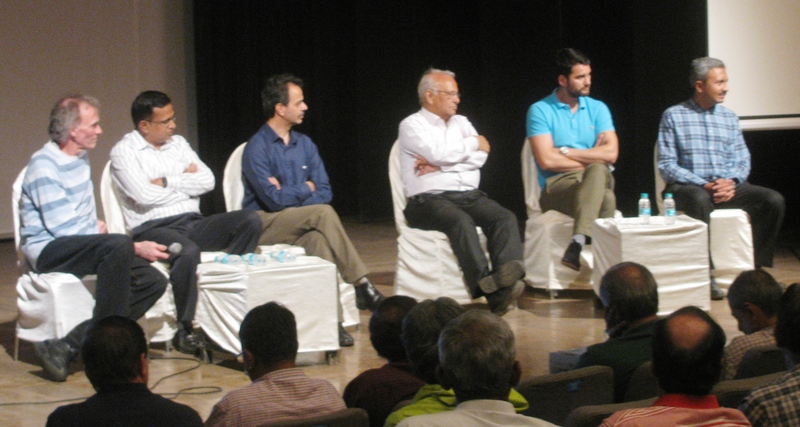 Discussing the story of an ill prepared big wall expedition from Mumbai and the story of others who didn’t succeed on Ali Ratan Tibba, Kamath said, “ we took the easiest route we could find to the summit. That’s what we always did in those days when we had to find our own route. We climbed within our limitations. 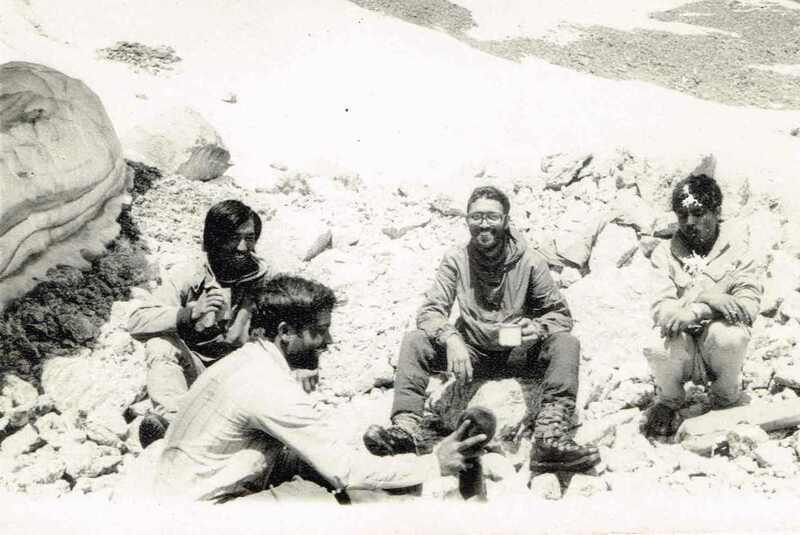 Plus, we used to do a lot of homework before heading out.’’ The route of the 1978 Ali Ratan Tibba expedition for instance, was based on a route originally indicated by British mountaineer, Bob Pettigrew. 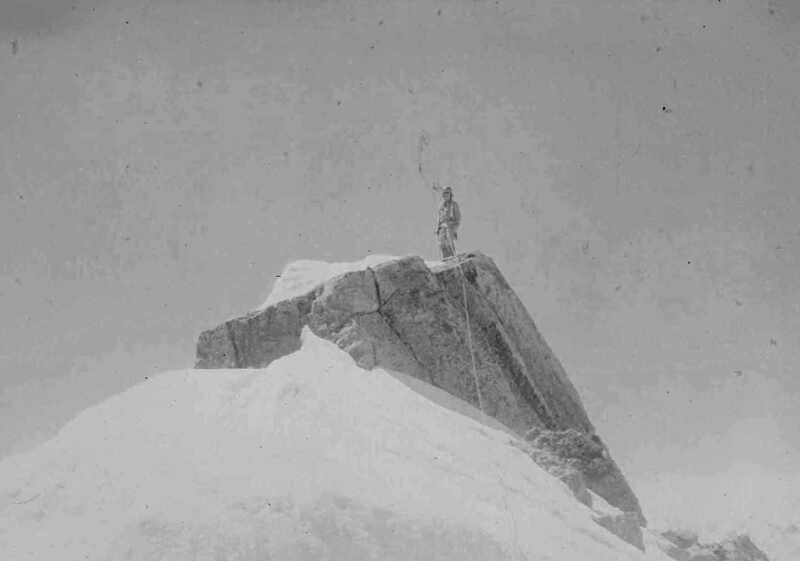 The photo he took of the relevant face of the mountain was available in the Himalayan Club journal. Of course by 1978, things had changed on the ground; mountain terrain is dynamic. But studying what Pettigrew recommended was helpful homework for the actual route-finding that followed. Surprisingly, despite much advancement in climbing, the clarity of the obvious and the easiest often eludes present day climbers. Route-finding has become an art lost in the haze of greater availability of resources and success advertised. Post 1980s, the business in homemade rucksacks and outdoor gear, gathered momentum. Lacking money, Kamath trained tailors for the task and outsourced manufacturing. 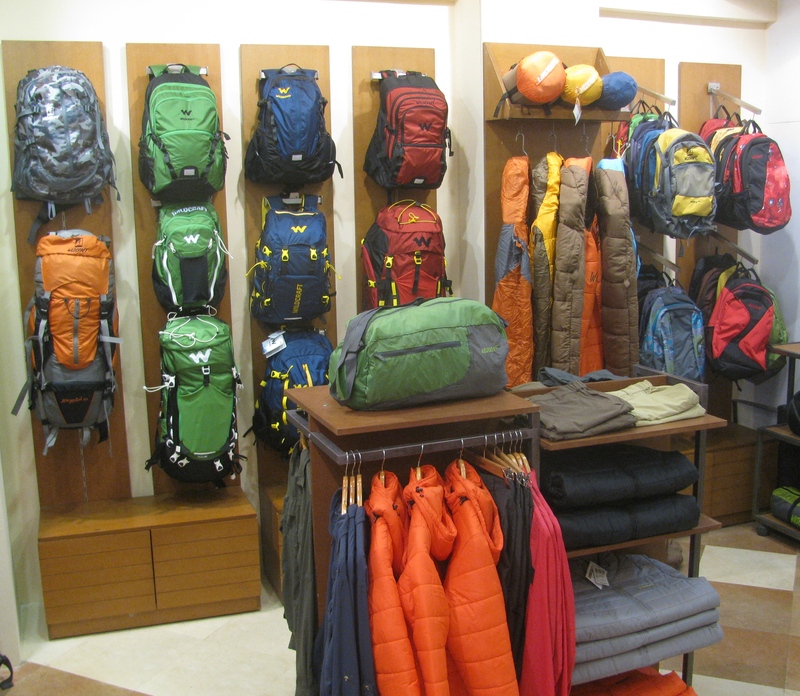 Around 1997, when I first visited AVI Industries, it was among Mumbai’s best known shops to pick up rucksacks, sleeping bags and other items required for the outdoors. In 1998, Kamath’s son Avinash joined the business (Kamath has three sons. Besides Avinash, the others are Ashwin who is in the US and Aanand who is in Bahrain. All three have sat at the shop at some time or the other). 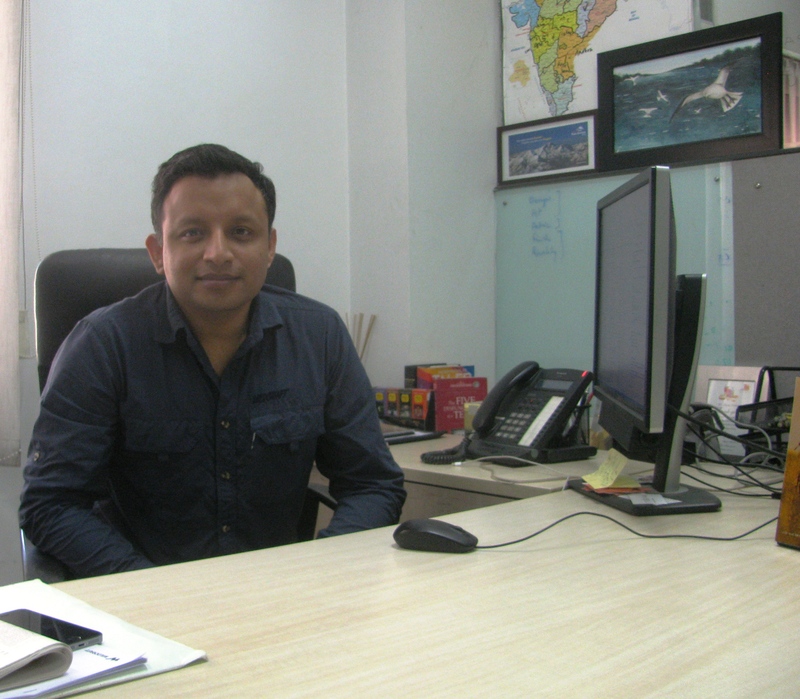 A commerce graduate, Avinash started taking a slightly different view of the business. He convinced his father that the soap business – which had been the family’s bread and butter at one point in time – was best shut down. Chemicals in the neighbourhood were not good for outdoor gear (particularly fabric), payment was rarely prompt for liquid soap sold and there seemed to be a future in the outdoor gear line. Within the outdoor gear segment, the duo continued making products like rucksacks, sleeping bags and the occasional piece of winter clothing. Locally made climbing hardware, harnesses – they were all stopped. 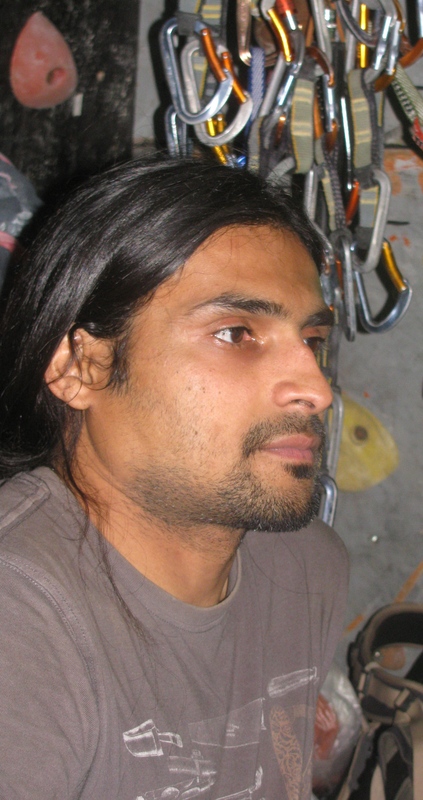 Avinash (aka Avi) worked the Internet and soon enough, secured the first external brands to be distributed by AVI Industries – Faders and Lucky, both making climbing hardware. Next they briefly sold Singing Rock climbing harnesses before settling down to sustained business with Rock Empire. Imported hardware and harnesses made sense because they came tested and certified. Today the brands distributed by AVI Industries include Rock Empire, Evolv, Boll, Trimm, HEAD, Mund, Wind Extreme, Vertical, Tendon and Makak. If you thought the father-son duo made a splash with this array of brands and products, you got it wrong. AVI Industries continues to avoid making a splash. Avinash and his brothers have been out many times with their father on hikes and climbs. In 2002, Avinash did his Basic Mountaineering Course from the Nehru Institute of Mountaineering. As he got into the family business, he also made sure that he attended the national climbing competition as a spectator. “ I went for every edition of that competition from 2003 to 2012,’’ he said. 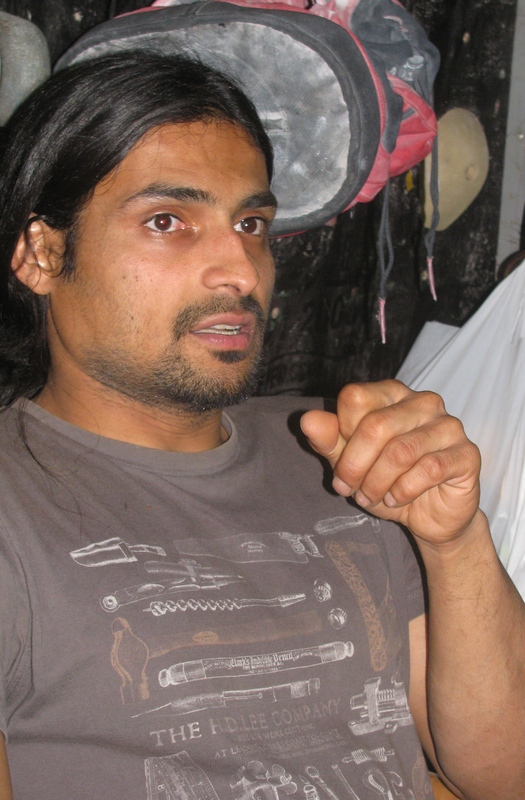 Avinash used the opportunity to talk to climbers, get acquainted with their perspective. The homework didn’t end there. His choice of brands to distribute, were all mid-level brands, not the big ones. Their products enjoyed the same certification as the big brands except the brand profile was modest. The choice was deliberate. He was seeking companies he could grow with. One great story in this regard would be Evolv. When AVI Industries became distributor for their rock climbing shoes in India, Evolv – co-founded by a designer who once worked for Five Ten – was new overseas. But their shoes were good and with well known climber Chris Sharma participating in the design process the brand rose to being among the top ones. Other details interest. Two geographies that have periodically dominated as import source for AVI Industries are East Europe (particularly Czech Republic) and Spain. East Europe has produced some great climbers; they make reliable products at prices that are cheaper than elsewhere in the western world. This aside, the fact that AVI Industries has a bunch of East European brands they distribute, provides scope to save on shipment cost. If planned and co-ordinated well, everybody’s products can be shipped in one go to India. While most of the above brands were accessed by Internet and distribution commenced with all paper work done from Mumbai, some years ago Avinash started becoming a regular at outdoor industry fairs in Europe. That has been valuable experience – exporter and importer got to meet, put a face to everyone’s names. But it is Avinash’s reading of the domestic market that truly engages. According to him, the Indian market for outdoor gear may have grown but it is not at all an easy one to be in. Import duties and tax rates are high. Almost half the selling cost of an imported product is taken up by duties and taxes. Avinash says he is not big on supplies to the defence forces, which has traditionally formed a major part of business for Indian suppliers of outdoor gear. He focuses more on the industry segment, where there are several instances requiring the use of ropes and equipment designed for vertical terrain. On this bedrock, runs the smaller retail business servicing climbers, hikers and such. However, the low level of awareness in the market is a problem. “ Meeting an aware customer is like coming across a needle in a haystack,’’ Avinash said. Consequently, it is hard to impress upon people what is quality or why it counts. This matters in the Indian outdoor gear market, where all players are not equally big. Some very big players with deep pockets tend to discount mesmerizing retail customers. “ The issue is not discount per se. We all know there can be seasonal discounts and discount to clear stocks. But year round-discounts finish off other players. Further, to show a discount, a seller displays two prices – the original price and the discounted price. It may seem value for money but it also spreads the message that quality and low price go hand in hand. In such a market, where people think they can always get the best for less, it becomes progressively difficult to create a case for good quality gear,’’ he said. Consequently, as he feels stalked by the discounting deep pocket-types, Avinash has chosen to operate nimbly, constantly churning his product portfolio weeding out what may not sell and retaining what will. He keeps an eye on what products are getting discounted by the deep pocket-types. Planning is short to medium term. “ You cannot be emotional in this business,’’ Avinash, 42, said. He has also consciously adopted another business practice – he prefers to sell products that are more towards the climbing end of the market; essentially gear that is application-specific and used in technical situations. The reason is simple. All the obfuscation of quality is happening in the low risk trekking / hiking portion of the market where details on quality don’t matter that much. Climbers and those engaged in similar high risk activity on the other hand, don’t compromise for they know they are playing with their lives. You can’t fool them. It had been a long chat in a room in the old building in Matunga. Below, the small shop was receiving a fresh coat of paint. “ And it will be just this shop for retail presence?’’ I asked. “ Just this one for now,’’ he said. The first time we met at the Jayanagar showroom of BumsOnTheSaddle (BOTS), Rohan Kini described himself and the shop as evangelists for cycling. That was couple of years ago. BOTS is now three shops big. There is the old BOTS facility and two new ones – one in Bangalore and the other in Pune – devoted to selling ` Specialized’ bicycles. There is a new one planned for Chennai and Rohan was excited about discussions to open showrooms in Hyderabad and Thiruvananthapuram. “ The industry has grown from infancy to something bigger. I refer to the whole Indian cycling community with all the related businesses therein,’’ Rohan said. BOTS is remembered as a pioneer in community-building. It used to be a single, multi-brand outlet with committed fan following. Specialized, which BOTS has elected to distribute, is among the top bicycle brands worldwide. “ How did you pick Thiruvananthapuram?’’ I asked. Even as it has changed, Kerala continues to carry the cross of erstwhile business unfriendly politics. It attracts less buzz than some of the popular investment destinations of this country. Not that Kerala lacks money. Thanks to traditional businesses, cash crops, tourism, a growing IT industry and a tonne of remittance in its banks from people working overseas, Kerala is wealthy. It has a literate, mobile population. It is a state with longstanding interest in athletics and sports, including cycling. Small still on the cycling map, its teams have nevertheless performed well at the national level. New bicycle retailers have opened shop in the state. Still, a shop there in the early stages of a brand’s growth In India is unusual. What gave BOTS the confidence to bridge that last gap; that bridge across the questions the state provokes? Uniquely, it ties in with BOTS’s own story. “ Why did you start a blog?’’ Rohan asked. “ I guess it is to write as I wanted to; compensating for what I miss or am denied in the regular publishing space.’’ I said. “ It is the same in business. As a company, I can achieve what I seek only by having my personal space. We defined that space developing a community around BOTS. Having worked on developing that exterior perspective, we are now growing the company from within. We are looking at the business from a long term perspective and building a strong foundation,’’ Rohan said. BOTS began operations from a terrace in Bengaluru. “ That did not stop Shiv Inder Singh of Firefox Cycles from allowing us to sell the Trek bicycles they were distributing,’’ he said, highlighting the importance of passion for what you are doing. Shiv Inder Singh himself had been the outsider who authored a quiet revolution in the Indian bicycle market, introducing modern bicycles and proper bicycle showrooms where none of that sort existed before. BOTS grew, eventually moving to larger premises. Rohan admits that even then, amid all the commitment and passion for being in the bicycle industry, BOTS was still nebulous when it came to long term business plan. They ran a multi-brand bicycle shop with a robust cycling community around it, the whole thing enveloped in evangelical fervour for cycling. Some time back, much after other American brands like Trek, Cannondale, Mongoose, GT and Schwinn had entered the market Specialized came to India scouting for a potential partner. One of their halts was BOTS. “ We had no expectations. Specialized visited many people and various establishments but for some reason they came to this enterprise run by four people. They spoke mainly of their philosophy. That matched with our thinking. It was unexpected that they would make us distributors for their products and yet, somewhere, it wasn’t totally unexpected either. The reason we took up Specialized is because it would be more impactful in terms of what we wish to do,’’ Rohan said. To sustain a business, he said, you have to be passionate about it. The first discussions between the two sides happened in December 2012. 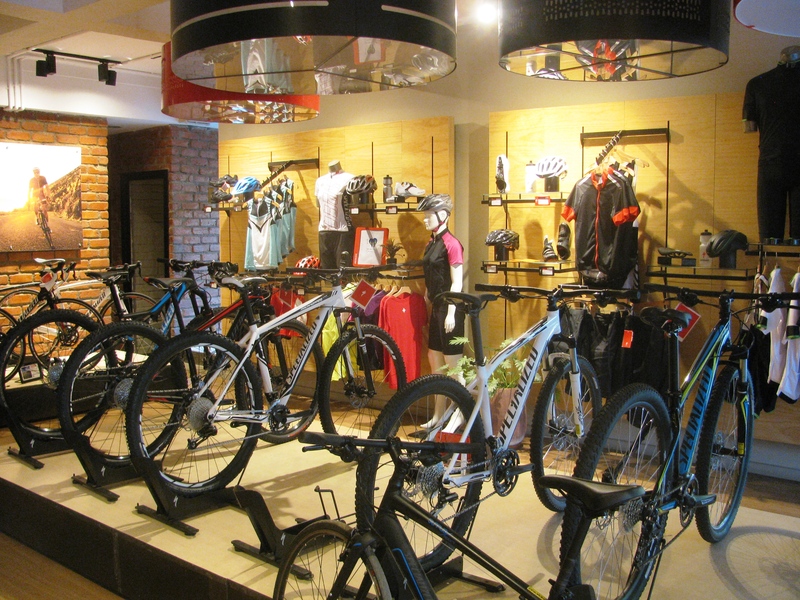 The new Bengaluru store devoted to selling Specialized bicycles commenced operations in August 2013. Pune followed. Both stores are 100 per cent owned by BOTS. The two shops in Bengaluru have distinct character. The Specialized store on Infantry Road caters to a customer who is buying a bicycle as a conscious option and not a necessity. The bikes are expensive. 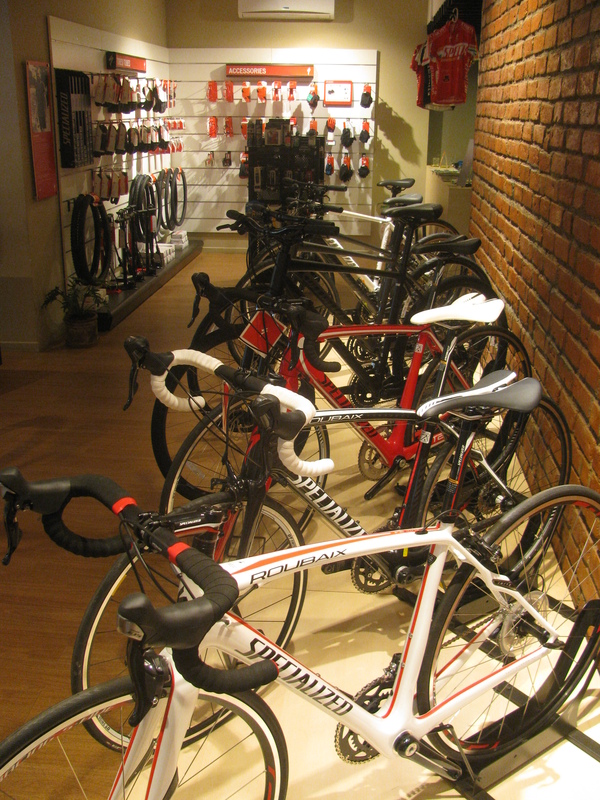 Specialized has been positioned as a brand to aspire for in India. 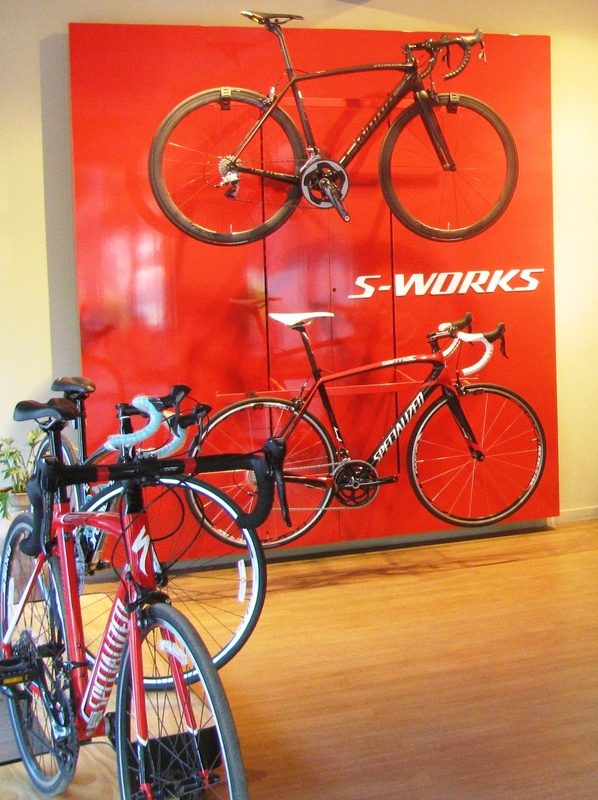 “ What the Specialized store is good at is delivering the experience a rider is looking for with product and service to match. In the store cycling feels immediately elevated,’’ Rohan said. 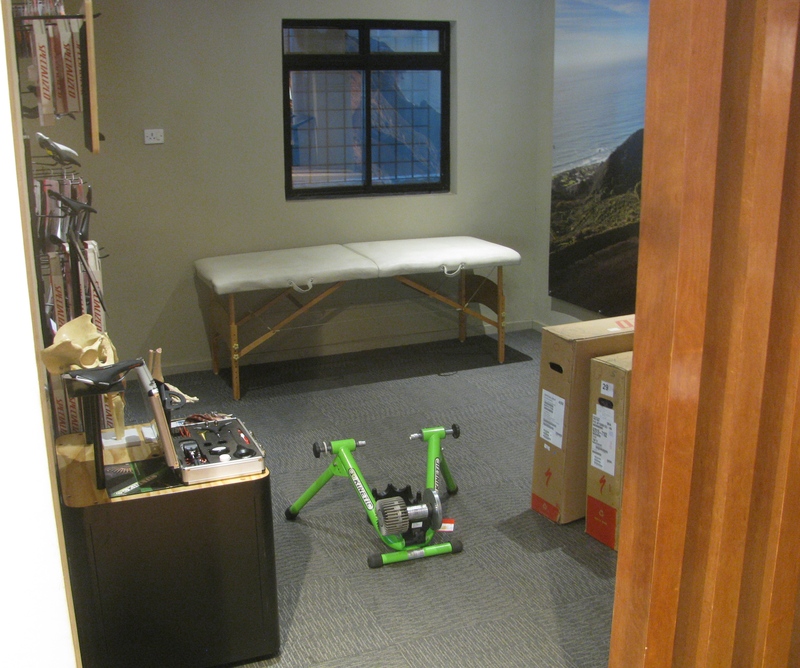 The store has a facility alongside called the Specialized Body Geometry Bike Fit program that addresses fitting the bike to the customer’s body size and his / her needs in cycling. 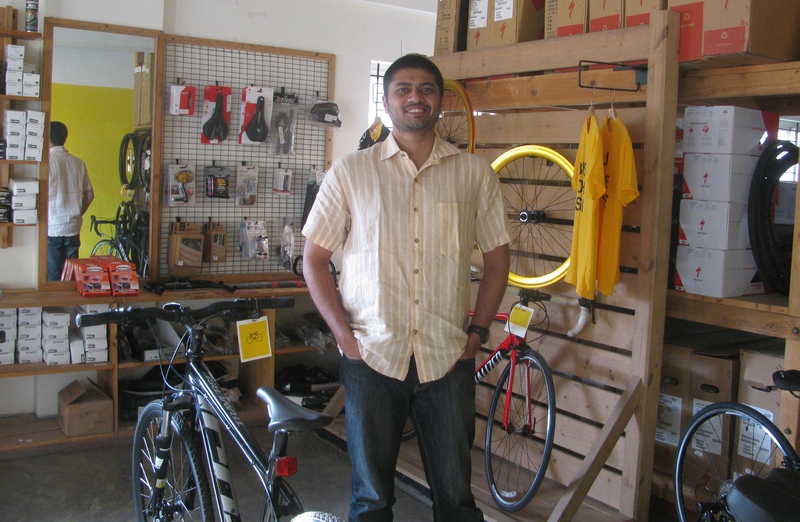 The bike fit section is headed by Naveen John, who is the current national time trial champion. The store was designed by Specialized. Store design, Rohan said matters, especially in India where retail is expensive and often not profitable. “ You need to be smart on how much less space you can have and how much more you can get out of it,’’ he said. The American manufacturer also has what is called Specialized Bicycle Components University (SBCU), with SBCU professors whose main job is to work with riders. They talk to the riders; the feedback goes all the way back to the design team. 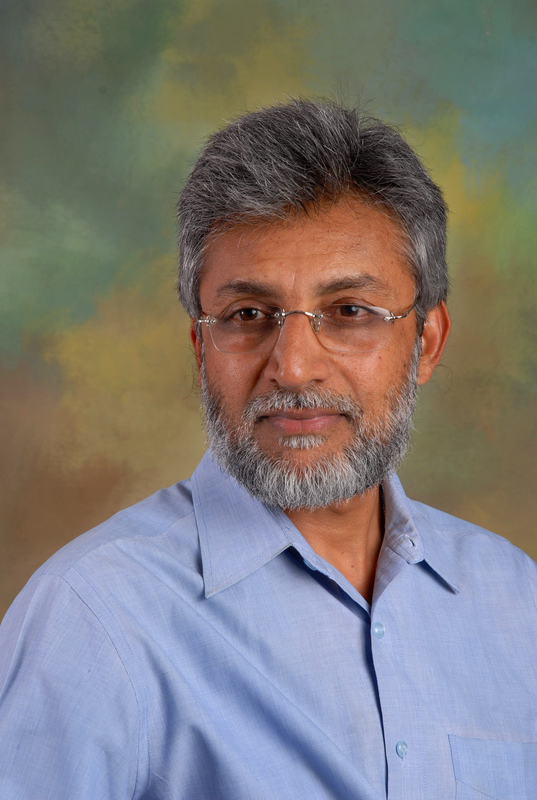 Vivek Radhakrishnan who owns, manages and races as part of the Specialized KYNKYNY Cycling Team is the SBCU professor in India. Where does this place the old BOTS? We are at the Jayanagar showroom; large, roomy with glass windows and bicycles of various brands within. The chat with Rohan hinted at the following. Retailing in India is not easy. BOTS, which is multi-brand, provides its promoters a pulse of the larger market for premium bicycles. The Specialized stores may likely be in comparison, a high end, low volume-game. But in that business BOTS is also distributor. That brings us to the community which has grown around BOTS – what about it? This may be viewed as an internal transferable competence for community-building, BOTS merchandise and cycling workshops. “ We could have a BOTS desk at every Specialized store,’’ Rohan said. Like the Specialized stores in Bengaluru and Pune, the proposed one in Chennai is BOTS-owned. However, the showrooms in Hyderabad and Thiruvananthapuram will be dealer run-stores. In the case of Kerala’s capital, Rohan said the enquiry for dealership had come from Thiruvananthapuram and while BOTS studied the case, the entrepreneurs in question went out and secured an initial order. “ They have signed on, are super stoked to be part of the Specialized India family and are excited about launching the brand in Thiruvananthapuram,’’ Rohan said recently in an emailed reply after this blog requested for an update on the new store. According to him, the DNA of the story fitted in with how BOTS itself was considered positively by established players despite debut on a terrace and little to show for sustenance at start except passion and commitment. I came to know Boulder 15 a dozen or more years ago, when Girivihar, Mumbai’s oldest mountaineering club, popularized rock climbing in Belapur. The place provided modestly long sport routes on rock faces and plenty of boulders – like Boulder 15 – to climb. The boulders lay strewn around on the hillside, just past Artist Village. The converging valley had a right arm and a left arm as you faced it. To the right were the old climbing areas; to the left were the new ones. Boulder 15 was tucked in the woods to the left. The access to the old climbing area was through a growing slum. It was dirty access but had to be accepted as such for a roof over one’s head is everyone’s battle in Mumbai. As long as the rocks survived, the climbers were happy. Belapur’s was the Mumbai / Navi Mumbai area’s first properly developed crag with sport climbing routes and boulders graded for difficulty of climb. Artist Village and the enclosed valley with hillsides hosting climbing crags are special for another feature. It has become a one stop shop for divinity. Many years ago, a couple of temples, a church and a mosque were all that God wanted. Then His appetite became voracious. There was a pattern – somebody would paint a small rock in holy colour; it would soon get coconuts and flowers placed before it, then a small roof would materialize and within months, a place of worship would assume shape. In the initial years of God’s hunger for land, the real estate gobbled up was away from the climbing crags. A good friend, who had purchased an apartment seeing the quietness and beauty of these hills, was soon disappointed. His large window began offering views of trees being cut and bulldozers in action. Today, on both arms of the valley, places of worship have come up. When the trend started, the climbers were worried. They speculated of approaching loss of places to climb. But they also knew – their freedom and rights are only as good as someone else’s. When a boulder is regularly climbed it acquires chalk marks. That’s how Boulder 15 used to be. Rock climbers love their rocks, seeing them as friends from an ancient past. Boulder 15 was a major attraction for climbers of beginner to intermediate grade. Overall, it is short, not exceeding perhaps six feet in height on the climbed side. But it provides a long traverse, the rock sharp enough to trouble the skin, an engaging pattern of hand shifts, carefully poised lunges and after all that – an exhausting pull-up to finish the route. It is a waltz in the park for experienced climbers. For those new to climbing and some months into it, Boulder 15 is engaging. I remained stuck in that intermediate grade of climbing; so Boulder 15 was a favourite. Some weeks ago, after a break of several years from climbing, I returned to Boulder 15. More places of worship had come up on that hillside; several trees had been cut, others marked with paint as though awaiting sacrifice. Rather worryingly, twenty feet or so from Boulder 15, somebody had dug the foundation for a structure. By the next visit, couple of weeks later, Boulder 15 sported a large trident drawn with red paint. Boulder 15 is not far from other boulders used for climbing. It acquired its name – Boulder 15 – because the climbing that happened in Belapur was enterprising enough to start one of India’s best rock climbing competitions more than 11 years ago. 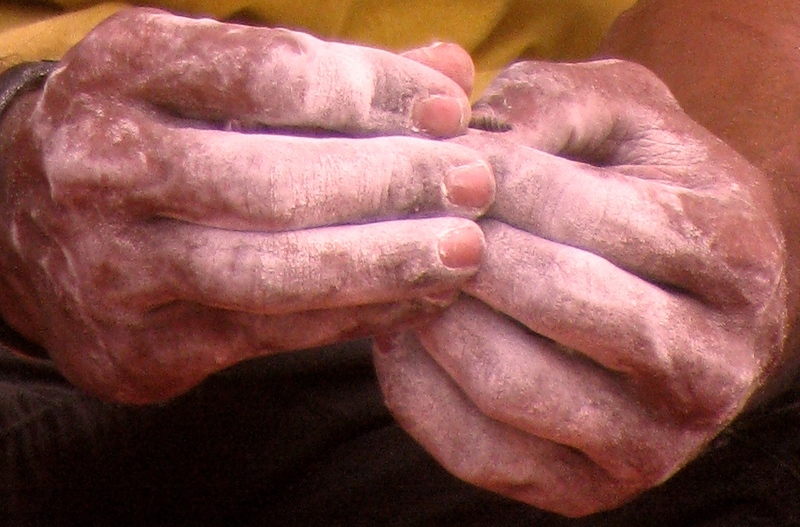 Each boulder used for competing was known by a number. Over time, as the encroachment on the hillside gathered momentum, the annual competition shifted to competing on artificial climbing walls. However, that was not before the local authorities promised to preserve the hillside as a “ nature park,’’ including empathy for climbing therein. Amid encroachment Belapur’s crags thus remained available for climbing even as elsewhere in Mumbai, crags faced pressure. Earlier this year, at an Udupi restaurant in Belapur, where a couple of us met for breakfast before heading out to climb, I recall chatting with climbers from Mumbai’s western suburbs come here to climb because they were denied access to their crags in Borivali. Despite its problems, Belapur had lingered an oasis. What happened to Boulder 15 therefore disturbs. It is understood that following the news report, senior officials from the local administration paid a visit to the hillsides in question for a first hand assessment of what had happened. 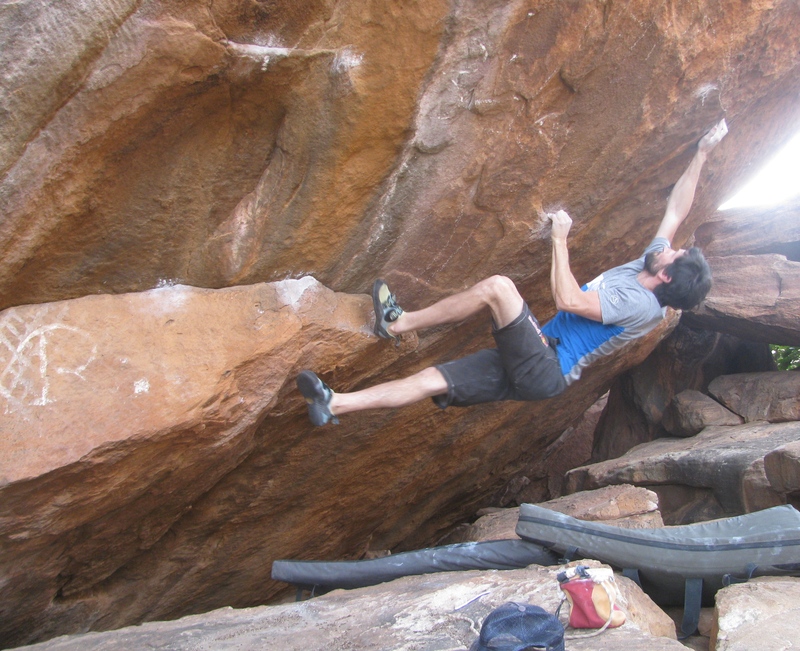 Boulder 15 and other similar problems highlight a lacuna in Indian climbing. While safety regulations have been debated at climbing associations and government circles, there hasn’t been similar institutional support for ensuring continued, undisturbed access to climbing crags and the preservation of these crags. Crags near urban areas are particularly vulnerable. Expeditions to climb Everest may become costlier in the future, Dawa Steven Sherpa, Managing Director of the Kathmandu based-Astrek Group, said. The Astrek Group has in its fold, Asian Trekking, one of the best known names in organizing Everest expeditions. Dawa based his views on the emergent need for better regulation on the mountain, underscored by recent events. A safer passage, which any regulation aspires for, could eventually mean more expensive expeditions. In April 2013, there was an ugly episode when a small group of elite mountaineers climbing by themselves and a team of Sherpa mountain workers fixing ropes for many other climbers, had an altercation that led to a clash ( for that story, please see http://www.thehindu.com/todays-paper/tp-features/tp-sundaymagazine/whose-rite-of-passage/article4936209.ece). In April 2014, a year after the previous incident, there was a terrible avalanche on Everest that killed 16 Sherpa mountain workers on the spot with another person dying later. He said options that could be explored include positioning service providers in distinct tiers based on such factors as years of experience, nature of work done, staff strength, extent of training for staff, equipment quality etc, following which, a given agency in given tier could be matched with a suitable expedition. You could also create a structure to move up the ladder. However, completely questioning commercial expeditions for being a business or frowning down upon them is ill advised because many important shared services like search and rescue, availed by alpine style climbers too, are supported by the richer revenues from guided ascents. The two climbing styles co-existing together made sense. Earlier Dawa had asked which expedition on Everest couldn’t be labelled commercial for under prevailing laws everyone climbing had to be associated with a trekking company and even alpine style climbers used porters to reach loads to the base of a mountain. One way to distinguish between the two would be to acknowledge as commercial, that expedition which wants every paying member or most paying members on the summit. According to Dawa, surveys had shown that a majority of the Sherpa mountain workers lacked formal training but all of them had informally picked up skills as their mountain work was hereditary. With better industry regulation looming and logical at that, mountain workers have begun acquiring formal qualification to guide. Dawa said that 33 Sherpas now possessed international mountain guide certification; in another month at least seven more workers would similarly qualify. On the other hand, a qualified professional won’t work for a low salary. Also, some of the qualified mountain workers prefer to work as guides in the proper sense of the word. They decline to carry clients’ loads. All this – from the likely shake-up within the 2000 odd trekking agencies to mountain workers improving their technical qualification – point to more expensive Everest expeditions in the future. On the client side, this weeding out could mean a drift back to technically competent climbers on Everest as opposed to anyone who can pay. Fuelling the trend further is the frustration from accidents like last year’s avalanche. When the avalanche occurred and people died, of the more than 50 Liaison Officers who should have been around (they could have helped coordinate with government), only three were present. The concerned government minister visited eight days later, for which event some of the liaison officers made sure to be present. These actions were noticed by the community of mountain workers, provoking anger, Dawa said. Dawa was speaking mid-February 2015, at the annual seminar of the Himalayan Club in Mumbai. Providing an overview of the concerns of Sherpa mountain workers, he said that they saw their job on Everest as traditional and hereditary. They felt that risk rose with price war; the industry’s rules and regulations were not known well to its rank and file, government decisions were sometimes ad-hoc and not including mountain workers in the process, a professional rescue squad is absent, priority in rescue goes to foreigners, the mountain workers wanted a bigger share of the royalty collected from mountaineering to be ploughed back into the industry and there should be better employment conditions and better monitoring by government of the conditions on expeditions. A panel discussion on what Everest climbs had come to be – featuring Victor Saunders, Lindsay Griffin, Umesh Zirpe, Dr Murad Lala, Harish Kapadia, Divyesh Muni and Dawa – witnessed heated debate around Zirpe’s successful leveraging of Everest’s popularity to raise resources for climbing 8000m peaks and Kapadia’s contention that many technically challenging climbs existed, often unexplored, in the less expensive smaller peaks of the Himalaya. Interestingly, costs are lower to attempt Everest by routes other than the much climbed normal route; costs are also lower for climbs in the off season. There are few takers. This is the updated version of an article originally published in 2011. Over a decade ago, we were fast approaching the departure date for a mountaineering expedition. The experienced team members had imported backpacks. The rookies lacked anything comparable. We headed out to meet a gentleman near Churchgate in Mumbai, who had brought to town large backpacks made by Wildcraft. Those days, Mumbai had no Wildcraft dealer; this man was an aspirant. A black and green `Zanskar’ by Wildcraft – that became my first serious expedition size-backpack. Months later, I made the journey to Bengaluru and the garage-shop in Jayanagar, Wildcraft functioned from. I was merely doing what many did. For us, Wildcraft was the backpack we heard of, searched for stores selling it and eventually made the pilgrimage to Bengaluru to buy. Now Wildcraft has over 100 exclusive stores nationwide and many more shops that retail its products without being exclusive to the brand. Wildcraft’s genesis almost 25 years ago was similar to how many outdoor gear businesses started. There were these folks addicted to outdoor sports; they scouted around for gear, found little and instead of complaining, decided to make it. Dinesh K.S, Co-Founder, Wildcraft, belongs to that league. He is an engineer given to rock climbing and mountaineering. It wasn’t long before he was forced to choose between his job at an electronics company and, expeditions. Those days the economy was just opening up. Bengaluru was a hot spot for garment-outsourcing. The basic raw materials for making outdoor gear could be chased down locally or traced to suppliers overseas. Enter Wildcraft. Wildcraft’s first product was a chalk bag born from climbers’ needs. Its first major product was a dome tent. The tent wasn’t for sale but it gave the company’s founders a taste of the Indian market, which had neither volumes in outdoor gear nor viable price points. The company shifted to backpacks; everyone in the outdoors needed one. Born from hands-on experience, Wildcraft products were relevantly engineered. They were also well designed unlike some of the other competing indigenous products, which were functional without much attention to aesthetics. Using outsourced manufacturing facilities, the company made backpacks, sleeping bags and a modest range of outdoor clothing besides selling imported climbing hardware. It also had a services wing catering to outdoor activity and management programs. A small garage was office and shop. However the struggle for scale continued. With the country very low on active lifestyle, the Indian market for outdoor gear was abysmally small. Help came from an unexpected quarter. The IT boom provided relief. As software engineers poured into Bengaluru, the demand for laptop bags and smart daypacks rose. A product line thus opened up which was sufficiently big for the iconic but small-volume outdoor gear business to piggy back on. Dinesh recalled a specific instance. Wildcraft makes a sleeping bag that packs really small. Whenever Bengaluru faced a bandh (shutdown called by political parties) and IT companies wanted staff to overnight on premises, they placed a large order for this sleeping bag. Alongside, orders for daypacks continued. Still, brand Wildcraft lacked a road map as visited manufacturers in any overseas market with well entrenched outdoor lifestyle. Around this time, Dinesh became a mountaineering instructor with the US-based National Outdoor Leadership School (NOLS), splitting his time between courses in India and the US. Wildcraft drifted. There was a churn in the original set of three partners running Wildcraft. Two new faces joined, whose actions have redefined Wildcraft. Although not from the outdoors, Gaurav Dublish and Siddharth Sood were MBAs working overseas. 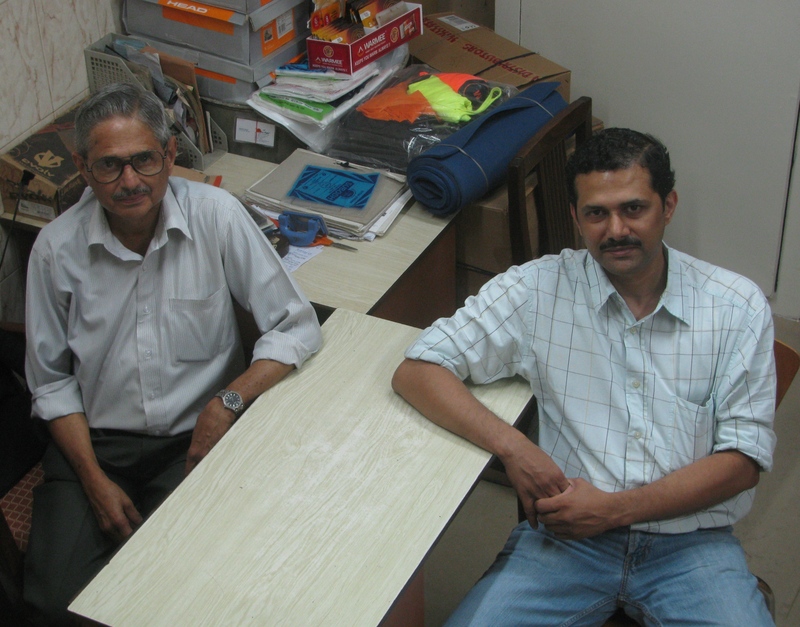 After studying the business and drawing up plans, they invested, joining Dinesh as directors. In a nutshell what they seem to have done is harness Wildcraft to ambition, forcing the brand to articulate what it wants to be thus checking that drift. The services wing was shut down. Between services and products, when viewed through the prism of scalability, products appealed more. Globally, outdoor brands broadly fall in two categories – strong activity-based niche brands associated with a few products and large brands straddling a range of products. Wildcraft’s initial phase was the former. Could it have continued there? “ Numbers matter when it comes to sourcing and negotiating better prices. Numbers are everything today, so you must have more sales counters,’’ Dinesh had said in 2011, when this article was first written. By early February 2015, the once reclusive Wildcraft had 100 branded retail showrooms in India. There were 20 franchised outlets. Most of these 120 outlets were profitable save five to six outlets, which opened recently. Approximately 25 per cent of company turnover came from its owned and franchised outlets. The balance 75 per cent was from distribution, large format stores, online portal sales and institutional sales. In 2011, its top five showrooms were already past Bengaluru-centric; they were Jayanagar (Bengaluru), NOIDA, Kochi, Chandigarh and Vashi (Navi Mumbai). By 2015, the same mix was Lucknow (opened in October 2014), Mumbai Linking Road, Vashi (Navi Mumbai), NOIDA, Jayanagar and the outlet at Mantri Mall, Bengaluru. Wildcraft became a one crore-company in 2007. It crossed the Rs 100 crore-mark in turnover in 2013-2014. “ We should be Rs 160-165 crore by the end of 2014-2015 fiscal year and sail past Rs 250 crore by 2015-2016,’’ Gaurav said. Over the past few years, the company grew at a CAGR of 60-70 per cent, which over the next three to five years should settle to around 40-50 per cent. “ Basically, we grew by 100 times in seven years and plan to grow by ten times from where we are now in five years,’’ Gaurav said. As Dinesh pointed out in 2011, the transition attempted is towards becoming a big brand, retailing a variety of Wildcraft products founded in outdoor DNA. Gaurav had tweaked it slightly for better perspective – as yet there is no global outdoor brand from the tropics. The company now has its own factories – two in Bengaluru; the other in Himachal Pradesh, Speaking of the old Bengaluru facility and the then new factory in Himachal, Gaurav and Dinesh had said in 2011 that both facilities were cost-competitive despite location in India. In manufacturing, the challenge then was raw materials, which players in China and the Far East had better access to. Asked for an update, Gaurav said that Wildcraft had manufacturing costs that matched those prevailing in China. However more recently emergent manufacturing locations like Vietnam and Bangladesh would be hard to beat. The Indian market too is changing. In the past several years albeit in small volumes, brands like La Fuma, Millet, Quechua (from Decathlon, which has a major presence in India), Berghaus, Petzl, Beal, Camelbak, CAMP, Cassin, Rock Empire, Boll, Evolv, Boreal, HEAD, Coleman, Coghlan’s, Deuter, Lowe Alpine, Columbia, RAB and Hi-Tec, became available in India, not to mention standard fixtures like Victorinox. Some brands entered and quit or withdrew to study the market better; others continued. Fact is – thanks to growing momentum in the sports segment (across sport categories) and the progressive adoption of active lifestyles, the market has grown. Although price point and which sport will grow are still a matter of debate – and within each vertical’s story, an often inconsistent narrative – the Indian market is firmly past the stage of being ignored. Running, the most visible symptom of active lifestyle, now spans urban India. From tryst with two or three large Indian brands, the domestic bicycle market now hosts the who’s who of international cycling. Things have changed. Gaurav estimated the total market relevant to Wildcraft at two billion US dollars annual sales. He pegged the outdoor gear segment at $ 500-600 million; outdoor apparel at $ 800 million-1 billion and outdoor footwear at $ 800 million-1 billion. The `outdoor’ reference used here is defined on the basis of product design, materials used, construction and intended application for sports and outdoorsy activities. Needless to say, two product segments Wildcraft was studying in 2011 (and which it has since acted upon) were shoes and apparel. By early 2015, the company had a line of outdoor clothing and footwear. These lines of business separate the big brand from the small one. 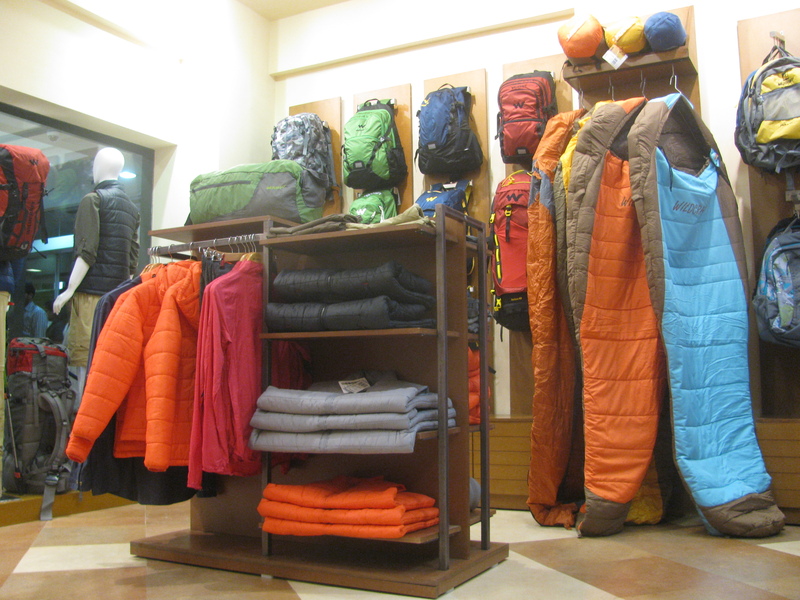 Internationally, big outdoor brands get 60-70 per cent of revenue from apparel sales. The company now has a design team which conceptualizes products and lays down the specs. Depending on the product, there is an element of outsourcing; for example, the company’s footwear is sourced from China and Indonesia. “ Around 95 per cent of what we sell is made by us,’’ Gaurav said. None of Wildcraft’s expansion can happen without money. Gaurav’s primary concern in 2011, as regards future plans, had been funds. Private equity may be an option, he had said. In mid-2013, news reports first emanated of an upcoming deal. Silicon Valley based-venture capital fund, Sequoia Capital, invested Rs 70 crore in Wildcraft. The money, Gaurav said, should take care of the company’s need for funds till 2017. It would be used to pay down debt, enhance production capacity, expand retail footprint, meet working capital needs and generally reduce the leverage of the company. The most visible aspect in the Wildcraft story is a brand grown big – especially the push in the physical retail space. Is that wise when e-tailing is exploding? According to Gaurav, 15-20 per cent of Wildcraft’s revenues come from e-tailing. He believes that seen from the brand’s viewpoint, all channels have a role to play. E-tailing gives exceptional convenience and choice to customers. At the same time, it is typically being fuelled by discounts and Wildcraft, he said, does not wish to discount. Second, he said, “ in the lifestyle space, touch, feel and fit will continue to remain an intrinsic part of the buying experience.’’ There is also the fact that the growth numbers recently reported in the Indian e-tailing segment are from the industry’s initial growth phase; its steady sailing will be at more settled growth rates. While all this provides vignettes of the Wildcraft story from a business and financial perspective, what may matter for the Indian outdoor enthusiast – the type who made the pilgrimage to Bengaluru years ago to buy Wildcraft’s backpacks – would be something else. The Indian market has a devil in the details. It impresses with it numbers and capacity for volume. The more important question is what do you do and where do you go with these numbers because the nature of these numbers has a tendency to shape the personality of your business to what the Indian market is. This may not work well in the adventure / outdoor products space. To provide a metaphor – when you climb and your risk levels rise (with commensurate expectation from your gear), you have already bid goodbye to the bulk of brands out there and reposed faith in a few, which deeply matter as the ones you trust your life with. For an outdoor company, treading the volume market is a balancing act because in as much as it enjoys proximity to top athletes and access to testing gear in the world’s greatest wilderness spaces, it must be careful not to dilute that DNA as it sells more and more. In India, this challenge is even more unique for although you run into potentially promising business volumes, the country was never traditionally a hotspot for authoring outdoor DNA, something Wildcraft itself realized when it searched for good designers. Outdoor talent is hard to come by in India overwhelmingly wedded to the settled life. Wildcraft articulates its growth thus – between the two potential business verticals of addressing the head-to-toe needs of the outdoor enthusiast and being an activity specialist, it has chosen the former. “ You can be one of the two,’’ Gaurav said, February 2015 in Bengaluru. This is fine strategy (the company already has apparel and footwear usable for the all the Indian seasons) especially when coupled with Wildcraft’s emergent desire to grow competence around the outdoors of the tropics. The bulk of the world’s outdoor gear companies groomed their DNA on experiences straddling the geography between the poles and the Tropic of Cancer / Capricorn. The equatorial belt and activities therein, didn’t attract as much. Addressing it will be engaging. But it will be a challenge, fitting such transition into the existing global narrative and perception of outdoor DNA. As Wildcraft courts business, some shifts are already showing. For example, the company is a large manufacturer of backpacks by volume. It has products devoted for rugged outdoor use, which have been recently improved as well. But the numbers-chase in the market has the centre of gravity in this business firmly in the small backpack category, especially in daypacks used by youngsters and such. You suspect a similar drift in the preference to go with head-to-toe as opposed to being activity specialist. 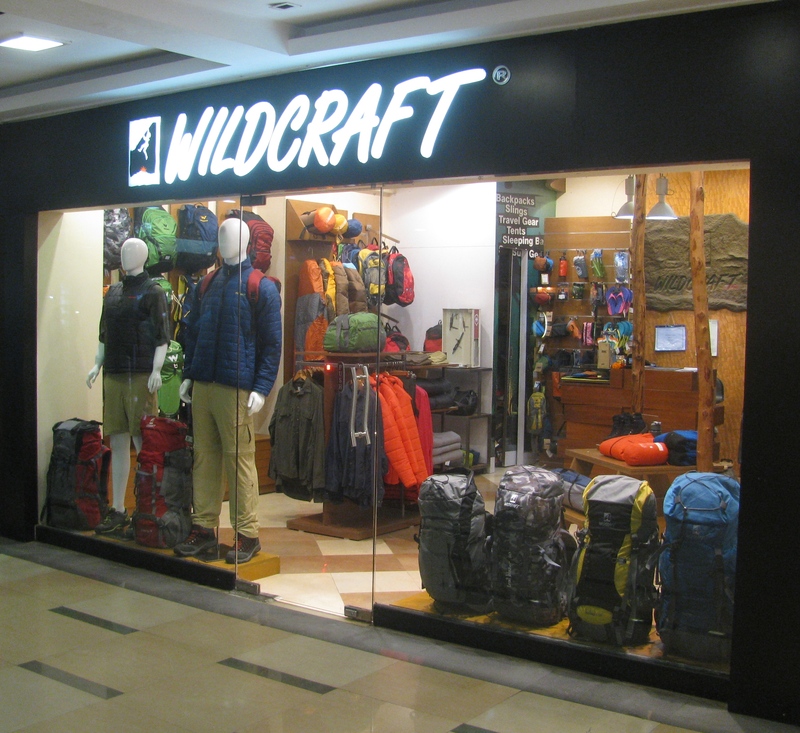 Wildcraft’s current strategy is fetching it revenues; in fact its revenues have grown sharply. That in turn, probably enhances its faith in the new strategy. But how can it stay convincingly ` outdoor’ despite the realities of the relatively non-outdoorsy Indian market where people buy outdoor stuff to seem outdoorsy than actually be out? Can volume play mislead an outdoor company into preferring the softer product segments? – This will be what any observer from the outdoors will track in Wildcraft’s evolution. Viewed thus, specialization in activity has its value. The reason you buy clothes for running from a shop that sells running gear or clothes and footwear for hiking / climbing from a shop that sells gear for the same, is because the irreplaceable and most wanted are also around. They add to the discerning customer’s conviction when buying related or more peripheral stuff. The outdoor DNA is actually all about zeroing down on the irreplaceable, the pure core. If you move away from that ethic, you sell more but in the eyes of the outdoor enthusiast, you just became the mainstream. It then becomes only a matter of time before the mainstream picks up the buzz from the hard-core and a brand loses its aspiration-value. The market is not only buying Wildcraft products, it is also watching it. In the local trade with its share of stores begun by trekkers and climbers, Wildcraft’s strategy is often debated for departing from the typically cautious outdoor approach driven more by passion than appetite for business. The old school understands the organic, home-grown business model. Did the team take a real risk by scaling up? On the other hand, if Wildcraft succeeds, that would be a measure of the market. That is when the action would commence for businesses run by its critics as well. “ We welcome competition. 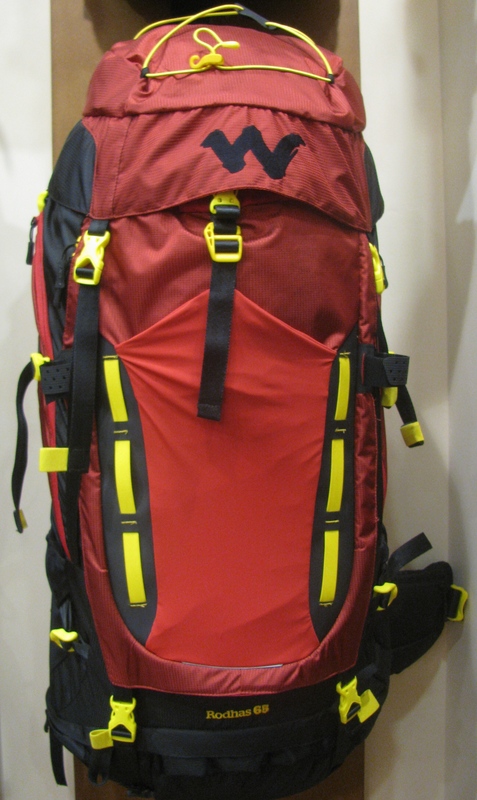 The more the competition, the better the market buzz around outdoor products,’’ Gaurav had said in 2011. Vaibhav Mehta has been associated with Girivihar’s annual climbing competition at Belapur, Navi Mumbai, since its inception. He is the technical brain, route setter and in many ways, the raison d’être of the competition. It is hoped that next year -2016 – Navi Mumbai will host a World Cup in bouldering. Subject to the receipt of all required clearances from authorities, the event, once official, will be organized by the same team which worked behind the annual competition. Vaibhav – he works and lives in France now – was in Belapur recently. During two days spent discussing the World Cup project and catching up on climbing at the local crags with his friends, Vaibhav spared time to talk to this blog. The annual climbing competition organized at Belapur, Navi Mumbai, won’t be happening in 2015. Can you explain why this is so? The whole idea of not having the competition this year is to move toward our longstanding goal – the World Cup. We have already done leg work in terms of meeting officials, preparing plans and creating initial documentation. Had we conducted the annual competition this year, then our efforts to put up the World Cup would have been compromised. It made sense to step back and think about the goal. The other thing is that even after conducting the competition for eleven years, resources remained a problem. Every year as the competition approached, it was a fire fight. We need to address resource-raising comprehensively. On account of all this a break was warranted. In the world of climbing, we hear of World Cup and World Championship. How are the two different? The World Cup in bouldering, which is what we are interested in, happens every year. It falls within a season of three to four months and includes six to seven World Cup events. The World Championship happens once every two years. The format is the same. Some venues strongly associated with the climbing culture, like places in Europe and within that, places from countries like France and Germany, tend to repeat more than other venues. That said, I would think that the International Federation of Sport Climbing (IFSC), is keen to promote the sport and would look at venues in regions where climbing is catching on. I am sure they are aware of India on the rock climbing map thanks to internationally known climbing locales like Hampi and Badami. They are aware of the potential. At what stage are the efforts to bring a World Cup to Navi Mumbai? What specific disciplines will it cover? The World Cup will feature bouldering. In terms of how far we have reached – we secured approval from the Indian Mountaineering Foundation (IMF); they have said they are willing to collaborate with Girivihar for the World Cup. The venue will be in Navi Mumbai. All the preliminary papers have been submitted to the IFSC. We are now awaiting their word. Should it be a go-ahead, then the real work towards organizing the event will commence. One of Girivihar’s internal mailers on preparations for the World Cup spoke of selecting a team of Indian climbers and training them to participate in the event. Can you elaborate on what you have in mind? When the IFSC awards you a World Cup, the host country typically gets a quota of ten climbers to participate in the event. We will try to find young, promising climbers and train them to compete with the best, at the World Cup. Most likely, the team will be jointly decided by the IMF and Girivihar. There is a reason for my saying so. At eleven editions old and a well documented exercise at that, the Girivihar competition has data on the performance of many climbers who participated, some of them repeatedly. I am not aware of similar data for bouldering, spread across so many years, with any other event in India. This is data that can be used as valuable reference material. And it must be used in conjunction with other relevant factors, like a climber’s ability to handle the stress and competitive spirit you find at elite competitions. We know from experience that we have some good candidates. If this approach is unacceptable, then another method would perhaps be to go by the performance of eligible candidates over the preceding three years, including how much the climber has improved. We could have a selection trial, a simple test where you set up a few boulder problems to gauge how the candidate climbs, the climbing style shown, the person’s attitude and very importantly, how the candidate reads the route and uses the available time. All this is critical from the perspective of a World Cup. What I will emphasise is that this selection should not ideally be only about a climber’s performance. It should also dwell on the climber’s promise and potential to improve for we are complementing team selection with a training process. For training, we would love to send the selected team overseas, provided we have the money. I may be able to set the routes for selecting a team but I have no illusions about my abilities – at this stage, I am not good enough to be a coach. I can only guide. For the initial phase of training, we can possibly have an Indian coach. Or, we can have a foreign coach for the whole duration of training as the expertise of grooming climbers to world standards is anyway more overseas than here. The World Cup in Navi Mumbai is planned for May 2016. We hope for an intense training schedule and training camp that peaks for the World Cup. Ideally, the team selection should happen as soon as we get the IFSC clearance for the World Cup. The initial training should continue till mid-2015. After that, the team should focus on training specifically for the World Cup. An event of this nature needs sponsors. They like to know what their support can translate into for a given sport. Can you explain what the proposed World Cup can mean for competitive climbing in India? Why does this World Cup matter? Why this World Cup matters? I think we as climbers, have to make it matter. We have to make full use of this opportunity. It is fine to say that we organized a World Cup but it is even more important to clearly communicate the whole package, including its transference as inspiration to youngsters to get involved with climbing. There is definitely the promise of the World Cup having a multiplier effect on the popularity of climbing in India. If you have noticed, there is a climbing culture slowly growing. For example, in whatever modest way it may be, a lot of indoor climbing walls have come up. Imagine what can happen if these climbing enthusiasts also got to see the best in the world, in action. And the best in the world will come if you have a World Cup. As I said, there are around six to seven World Cup events every year. As you participate in each, you accumulate points in accordance with how you finish at each event and by year-end you have climbers with the most number of points. As this final tally matters, usually, the best climbers arrive for every competition. So far you saw them only on video. Now you see them climbing in real life. This should add to the potential multiplier effect of the World Cup on Indian climbing. Not to mention, the ringside view of top athletes that aspiring climbers here will get. Can you tell us how the typical World Cup feels like? Most of the countries hosting World Cups so far are well known in climbing. In these countries, a World Cup generates much interest in the local community. They take pride in hosting such a competition; they also wish to see their home team do well. In India, we will have to create that curiosity and interest. The question is – how well will the local community beyond the climbers themselves, respond? For that we are looking at specific events. Certain events during the World Cup and some that will continue after the World Cup to sustain the impetus. We are also looking at associated events that can happen during the World Cup; acts linked to BMX, skate boarding and slack lining. You have been part of the Belapur competition’s organizing team for over a decade now. How useful will that experience be, particularly when it comes to organizing the World Cup? Organizing the Belapur competition for eleven years has been a valuable experience. It has been trial and error but we have rectified our mistakes and improved considerably over time. This experience will definitely helps us in organizing the World Cup. Looked at differently – the upcoming event will be called a World Cup but at heart it remains a competition, which is what we organized for the last eleven years. However there will be challenges. The main one will be – scaling up the resources required to match the size and expectations of the World Cup. The overall budget is much bigger and within that details matter more than before. For example, previously we used to host half a dozen foreign climbers during the annual open competition. At a typical World Cup, there will be 20-30 of them and standards to be followed. We can’t compromise on standards. Things hadn’t worked out as well as he wanted for Kilian Fischhuber. Kilian is a multiple winner at bouldering World Cups; he has also been European Champion. Besides bouldering, Kilian climbs sport routes. Last year, as reported earlier on this blog, Kilian had opened two routes on the edge of Badami’s Temple Area crag. Both held potential to exceed Ganesha (8b+) as the toughest sport climbing route around. One route, next to an established line called Samsara, was nearly climbed by Kilian in 2014. The second, an overhanging route on the prow of a nearby rock face, seemed epic with two very hard moves as firm hurdle to overcome. A year later in January 2015, Kilian was back in Badami with Pune based climber and fellow Red Bull athlete, Tuhin Satarkar. Etched clearly on their agenda were the pending routes. “ This time I came specifically to try one of them. Last year I was pretty close to climbing it. This time I came to finish the unfinished business. But it didn’t happen,’’ Kilian said. Unfortunately, a chunk of time was lost ridding the said route near Samsara of a beehive. Days were lost thus. Then when the actual climbing started after the initial distraction, the route challenged. “ The moves involved are hard and powerful. The main aspect is friction. Downside is that the route bakes in the sun for many hours daily,’’ the Austrian climber, used to cooler climes, said. Fifteen degrees, he felt, may have been ideal temperature for him. “ Now I can’t climb it. But if conditions are ideal and somebody climbed it, I think the grade would be 8c+,’’ he said. The route on the prow had been speculated last year as tougher still; the sort an Adam Ondra may be interested in should he choose to. Comparing the route – the variation of Samsara – to Ganesha, Kilian said, Ganesha featured more powerful moves and was endurance-based. This new route had hard moves but mixed in as main ingredient – friction. It also meant, there was nothing particular that Kilian could train for while preparing to tackle it. He spent eight days trying the route in 2014. “ In all that I have climbed before, the longest was like six days. I am pretty impressed by the stubbornness of this route,’’ he said, an evening in Badami, this January. “ In a way, I really want to climb it. I came in good shape this time. But I didn’t know if the conditions would be any better. I don’t know if a one degree variation in temperature can make any difference. I don’t know,’’ Kilian said. According to him, really tough climbing routes are typically attempted in more hospitable, cooler temperatures. “ The route is an open project now. I will be glad to hear if someone successfully completes it. It will be great,’’ he said, accepting the situation. As they are unclimbed, both routes have no name yet. 2014 had been Kilian’s first visit to Badami and India. “ The special thing about Badami is the quality of rock. However as good as the rock is, as challenging are the conditions. You have to cope with heat and humidity. Climbing at your limit in Badami is really challenging. 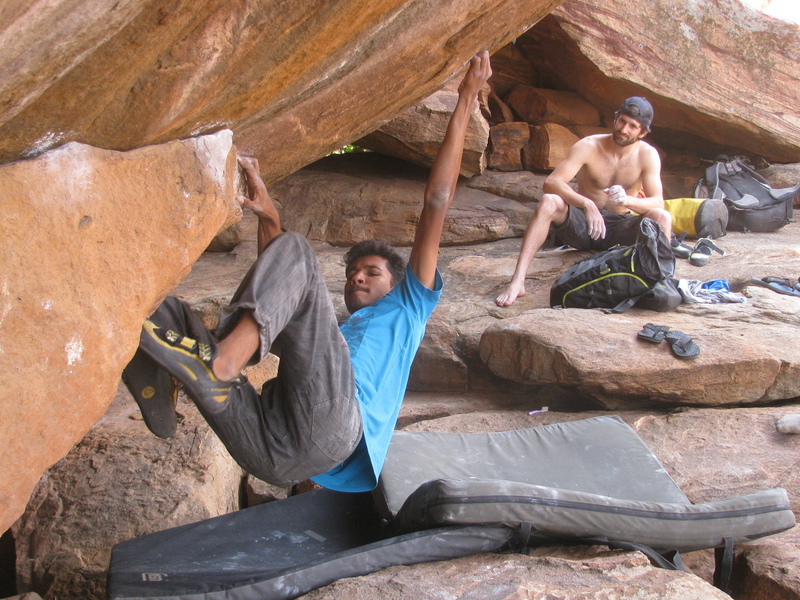 That also makes climbing routes in Badami special. For those who do it, it becomes memorable,’’ Kilian said.